Darren has always had an interest in racing and high performance driving – some of his most memorable motorsport experiences have been driving a Formula 2000 car at Shannonville (way back in 1994), a NASCAR Nationwide car on the high banks of Daytona, and a Porsche Cayman R and 991 GT3 on the road course at Las Vegas Speedway. Darren had done a little karting at team building events with work colleagues when his wife sent him and some of his friends to Top Karting to celebrate his 40th birthday. Needless to say, he had an absolute blast. Darren and his @LM_Racing team-mate and friend Eric Lefebvre got hooked and spent a a large part of 2012 on the track at Top Karting, in addition to visiting rental tracks across the country while traveling. Also in 2012, Darren went to the Jim Russell Karting Academy at Mont-Tremblant where he spent some time in a Rotax under the tutelage of kart and Formula 1600 racer Zach Robichon. Instant addiction ensued, and from there, he got to know Paul Lalonde during the 2013 Top Karting Winter League events and ultimately made the trip to LCQ to test his prowess against the club racers. For 2013, he raced a rental Margay 4.2 and in 2014, he bought his own Margay Brava 4.11 to challenge for the OGKC Masters crown. His favourite track is Le Circuit Quyon, located in Quyon, Québec. Darren enjoys the numerous track configurations – it makes racing not only convenient (LCQ is his home track), but also challenging! NASCAR was the motorsport series he first started watching and he quickly became a Dale Earnhardt fan, seeing him race at the first five Brickyard 400’s. He is also a fan of Dale Jr. and Tony Stewart. Darren’s objective for 2018 is to win the Masters Championship! To keep up to date on Darren’s journey toward the top step of the Masters podium of the Ottawa-Gatineau Karting Championship, follow him on Facebook (https://www.facebook.com/LefebvreMalletteMotorsports ) and Twitter (https://twitter.com/LM_Racing ). 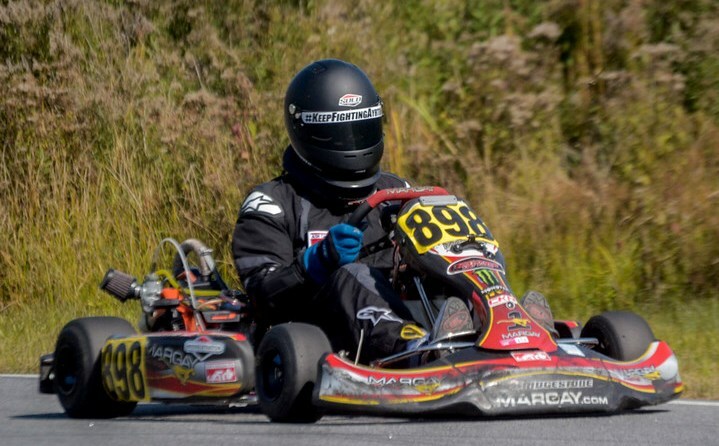 Previous PostOGKC Racer Spotlight – Vincent LamotheNext PostInterclub Event Confirmed – LCQ Karting Club and PSL Montréal!